Image Size: 33 X 24 in. Image Size: 52 X 38 in. It amazes me how a man from China has such an interest in the Native Indians and paints them as if he were one of them, spirit-to-spirit. His work is of the highest caliber. - Michael Del Priore, Former Chairman of American Society of Portrait Artist. 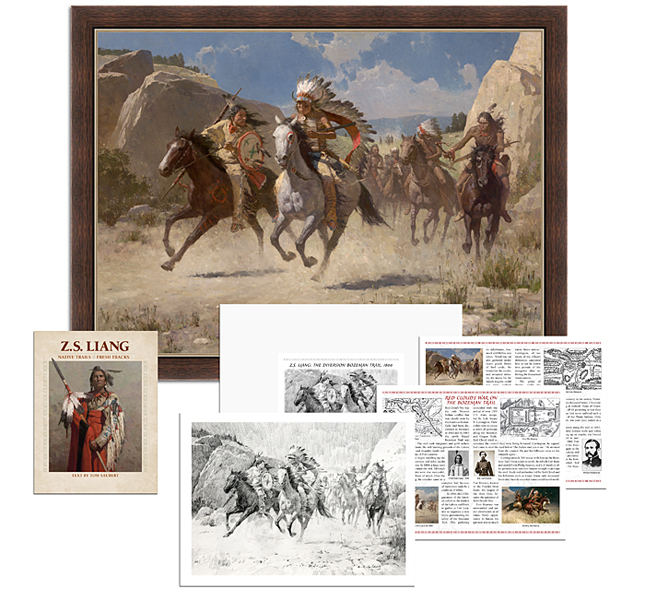 The Diversion, Bozeman Trail, 1866 was featured at the 2014 Couer D’Alene Auction and sold for over $100,000 alongside paintingsby Frederick Remington, Charles Russell and Thomas Moran. It’s based on events near Fort Phil Kearny one of three the U. S. Army completed along the Bozeman Trail during the summer of 1866, along with Forts Reno and C. E. Smith. They were erected for the protection of emigrants, gold seekers and freight wagons traveling along the trail, which took them through the buffalo and game-rich hunting grounds of the Lakota Sioux bands and of the Northern Cheyenne and Arapaho. Just as Sitting Bull’s Hunkpapas detested Fort Buford on the Upper Missouri, so too, did Red Cloud’s Powder River Oglalas keep Ft. Kearny almost constantly besieged. One daring ploy, often used by the Indians against the soldiers during the many skirmishes, was a decoy feint. This involved sending a small group of fighters against a larger company of soldiers would fight off this small group and give pursuit. The retreating warriors were actually a decoy to lure the soldiers into a surprise trap made up of superior numbers of Indians waiting to envelop them. Z.S. Liang is one of the most important painters of contemporary Western Art. Native Trails, Fresh Tracks will only help to further cement his reputation. He has clearly struck a chord with collectors and this Commemorative Edition set is, indeed, a collector’s item.